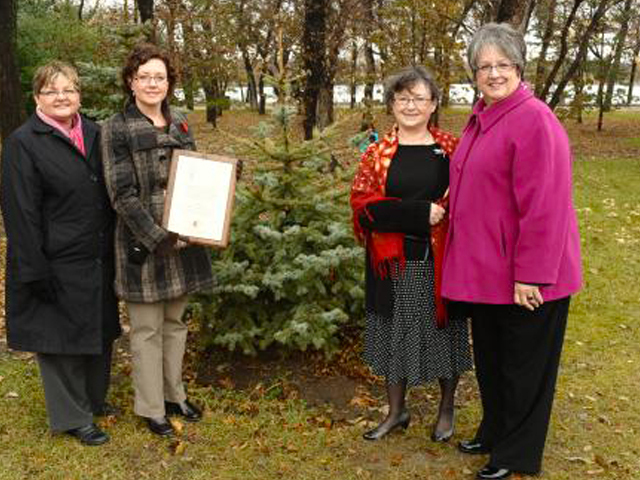 Tuesday, October 27, 2009 Hemophilia Saskatchewan commemorated the tainted blood tragedy by dedicating an evergreen tree on the grounds of the Legislative Building. Seven MLA’s, representatives from Hemophilia Saskatchewan, Canadian Blood Services, Wascana Centre Authority, and the media gathered near the tree where Faye Katzman conducted Saskatchewan’s first Tree of Life ceremony. After a moment of silence, Elaine Zech, vice president at Hemophilia Saskatchewan, presented the Canadian Blood Services with a commemorative plaque. Everyone then gathered at the Canadian Blood Services Clinic fora tour of the facilities and lunch before members of HSK returned to the Legislative Building, where they were introduced to the Legislature. The commemoration event, a Hemophilia Saskatchewan initiative,was supported by Canadian Blood Services,Wascana Centre Authority,and the Canadian Hemophilia Society.